New Delhi:(Page3 News Network)-Union Labour & Employment Minister Shri Shri Mallikarjun Kharge today inaugurated ‘Skilling India’, the Theme pavilion at India International Trade Fair, 2012 at Pragati Maidan, New Delhi in the presence of Hon’ble Minister of State for Labour and Employment, Shri K. Suresh. Speaking on the occasion Shri Kharge stressed for the specific efforts to impress upon youth, their parents and society as a whole, the need of skill development. He said skill development is one of the most important tool for empowering the persons, increasing productivity of the enterprise and competitiveness of the country. The main objective should be to disseminate information to the unemployed youth and all sections of society about employment opportunities for skilled person. 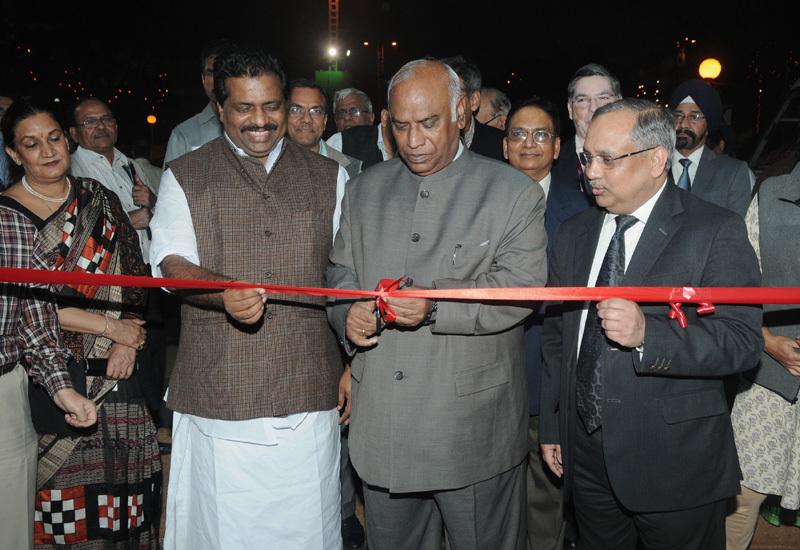 Shri Kharge said his Ministry has been at the forefront of skill development activities in the country. It offers multifarious opportunities of skill development through various schemes. Craftsmen Training Scheme , where training is offered through a network of 10341 ITIs. Total seating capacity is more than 14 lakh. It is also important to mention here that in last five years the number of ITIs and their seating capacity has been douled. In 2006-07 there were 5114 ITIs with seating capacity of 7.42 lakh. Today there are10341 ITIs with seating capacity of 14.54 lakh and another 3000 ITIs will be set up in unserviced block of the country, where no ITI exists. Training is conducted in 137 trades. Entry qualification is 8th, 10th and 12th pass. Duration of course varies from six months to three years. The minister informed that the DGE&T has taken several initiatives for upgradation of ITIs. It started with upgradation of 100 ITIs in 2005-06 with total outlay of Rs 160 Cr. In 2007-08 we took up upgradation of 400 ITIs with outlay of 1581cr with World Bank assistance. During the year 2007-08 itself we started upgradation of 1396 ITIs in PPP mode, where we have released Rs 2.5 cr to every IMC.. Industry is partnering the upgradation processes in all the ITIs. We have made Institute Management committee which is chaired by a leading local industrialist. Thus, in addition to modernisation of machinery and equipment interface with industry has also improved. He said during XII five year plan, the ministry has a very ambitious scheme of setting up of 1500 new ITIs and 5000 Skill Development Centres in unserviced blocks of the country in PPP mode. With these, we hope to achieve our target of skilling 100 million persons by 2022. Apprenticeship training scheme is another important scheme, where training is conducted through a network of 27000 industries having total training capacity of 3.37 lakh. In this scheme training is conducted in 252 trades. The training period varies from six months to four years. Entry qualification varies from 8th class pass to 12th class pass and ITI pass outs, the minister added. He also highlighted the importance of Delivery schedule which is very flexible. It can be part time, full time, weekends, onsite, offsite to suit various target groups. Courses are being conducted through more than 7000 Vocational Training Providers. Assessment is carried out through 46 empanelled Assessing Bodies and Certificates are issued by NCVT on recommendation of Assessing Bodies. The most important aspect is that Training and Assessment cost to successful candidates is borne by Government of India. Shri Mallikarjun Kharge appreciated the efforts made by ITPO, CII and organisations involved in creating thE theme pavilion and pressed hope that it will be able to spread the message of skilling to every youth in the country. The theme of this year’s IITF’2012 is ‘Skilling India’. This is for the first time such a theme has been selected by India Trade Promotion Organisation (ITPO). The theme pavilion exhibits the efforts made by various Government and Private agencies in achieving the target of 100 million by the year 2022 as set by Hon’ble Prime Minister. Many Ministries such as Ministry of Labour and Employment, Ministry of MSME, Ministry of Textiles, private companies like ILF&S, Sri Ram Group, Sector Skill Councils on Health, Logistics and National Skill Development Corporation are participating in the event. Smt. Rita Menon, CMD, ITPO, Shri Chandrajit Banerjee, DG, Confederation of Indian Industry (CII), Shri Ravi Mathur, Additional Secretary, Ministry of Labour and Employment, Shri P.K. Padhy, Principal Labour Economic Advisor, Shri Dilip Chenoy, CEO, NSDC were also present on the occasion.